The Alafi Auditorium during the 2014 production of David Mamet's American Buffalo. Photo by David Allen. Plan your visit with transport and parking help from our Directions page, and make a night of it with our Dining Partners, who offer special discounts for Aurora subscribers. 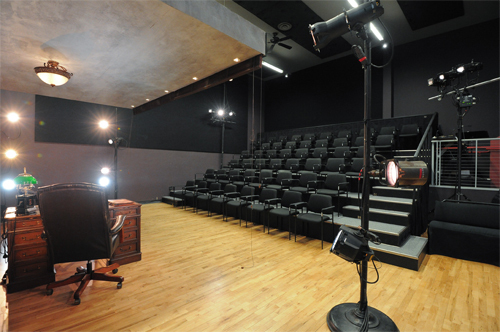 Aurora Theatre Company’s mainstage, the 150-seat Alafi Auditorium, opened in 2001 and is one of the Bay Area’s premiere spaces to experience live theatre. Seating on three sides of the deep-thrust stage allows every member of the audience to be no further than 15 feet away from the stage. The lobby to the side of the mainstage auditorium houses Aurora’s Box Office, concessions, and restrooms that are being updated in 2017. Beyond the lobby, Aurora’s administrative staff have offices on-site. Aurora Theatre Company is wheelchair accessible, and assisted-listening devices updated in 2016 are available for the hearing-impaired. Aurora’s black box theatre in the Dashow Wing, Harry's UpStage, provides an even more intimate setting with seating for 49. Harry’s UpStage opened in 2010, and since 2014 has been the site of at least one regular production each season. Harry’s UpStage has also been used to present special offerings like holiday cabarets, magic and improv shows, and experimental music drama; and to host donor and subscriber events. Harry’s UpStage is accessed by elevator or stairs from Aurora’s main lobby. Aurora Theatre Company is located in the heart of Downtown Berkeley’s Arts District, a vibrant cultural scene that includes our Addison Street neighbors Freight & Salvage, the California Jazz Conservatory, and Berkeley Repertory Theatre. Patrons at Aurora are a short walk away from both fine and casual dining including an array of specialty cafes, desserts, breweries, and craft cocktails.